Hundreds of people joined together for a day of events and activities centred on fighting climate change. With live music, crafts and stalls, conferences, talks and workshops, the Alternatiba festival was a chance for visitors to learn more about the issue. Organiser Joe Mobbs was among the 12,000 ­strong crowd at the original Alternatiba event in Bayonne, France. 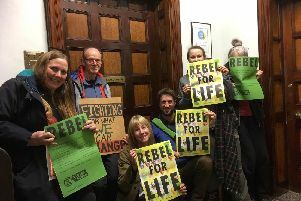 He later joined forces with others to organise something similar in the UK and the festival was a forum for campaigners and changemakers under the same umbrella of environmental justice and empowering ordinary people to act. Joe said: “A great day was had by all, and with 500 people, 50 organisations and businesses, 20 talks and workshops, 20 volunteers, nine venues in the town centre, two conferences, Alternatiba Todmorden is proud to have been the starting pistol for all the Alternatiba events in 2015. Inspired to action by demonstrations, stalls and talks from groups and organisations already tackling climate change, festival goers signed pledges to reduce their carbon footprint by switching out lights, going one day a week or more without meat or walking rather than taking the car short distances. And Incredible Edible, which plants edible crops in urban spaces, held a conference with founding members and leaders to talk about about their movement. Joe said: “Whether or not a binding legal agreement to limit greenhouse gas emissions is made in Paris, encouraging and bringing together those working on climate change in their own homes, streets and communities is important. “We can not leave it to political leaders to rescue the agreement in Paris. Organisers thanked all those who helped to make the event a success.